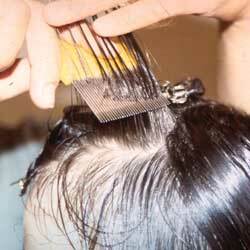 One huge benefit of going to an expert is that you get to see how to do a proper comb-out. The lesson will come in handy if you decide to try a comb-out at home, either now or as a preventive measure next time one of your child’s playmates has lice. This entry was tagged Cootie Catchers, Lice Comb, LiceTreatment, Professional Hair Lice Removal, Riyadh, Saudi Arabia, Umm Adam. Bookmark the permalink.